From the brotherhood of your favorite Outdoor Channel show Bone Collector. Official and Authentic Bone Collector Merchandise to support the hunting culture and lifestyle. Classic Bone Collector Emblem snaps and with Graphic logo on this leather belt tip. The Camouflage Canvas has leather backing for comfort and style. Sleek leather inlay down the center with Bone Collector embossed on the leather loop. Solid Metal Brass-finish roller buckle can be interchanged with your favorite 1.5"(38mm) buckle. 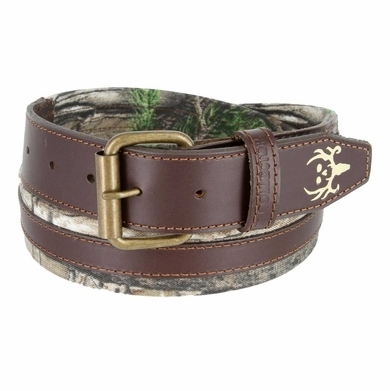 Sizing: Measure around where you wear the belt and order the closest size.